Way below build out cost ! Owner wants out. Bring your best offer!! Great location in the heart of downtown Escondido. Has a nice mix of commercial and residential customers surrounding the location. Located near big box retailers, movie theaters, the civic center and is part of a very popular food court. It's the go to spot for lunch. Location is bringing in approximately 29k per month in gross sales and owner has increased sales in each of the last three years! Bring is some marketing ideas to go after schools, catering and the super lucrative sports bar crowd and you will see the bottom line swell. Beer and wine license is in place. The current theme and food is very popular. Food reviews are great and decor/atmosphere is well received and fun. The kitchen is well designed and has the open style that everyone is looking for these days. 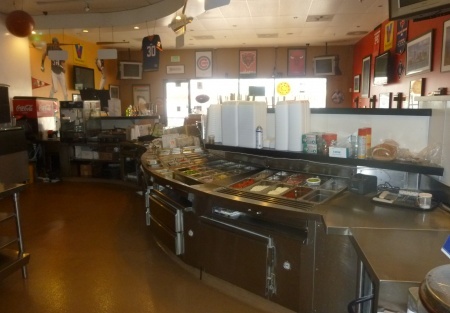 Restaurant is approximately 1850 square feet with a common patio area for outside/overflow dining. Current lease term expires in August of 2013 with a three year option available. Rent is $5100.00 with landlord stating that he would be willing to negotiate a new lease with a well qualified buyer. Expires August 2013 with a 3 year option-new lease available!